← Come Sail Away !!! 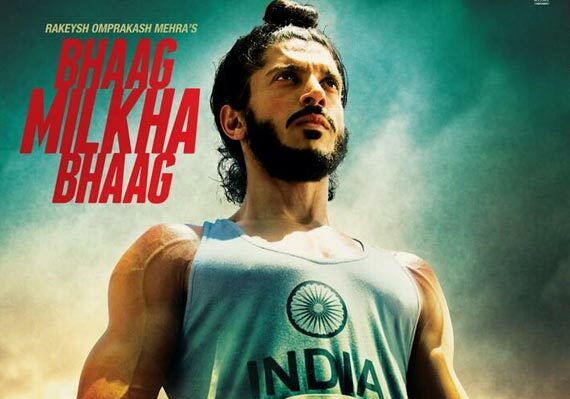 Bhaag Milkha Bhaag … there is no Finish Line!!! The most awaited movie of the year, Bhaag Milkha Bhaag is the story of one of the greatest athlete India has ever had. A story of achievement & disappointment, milestones & nightmares, passion & apathy. Most importantly a story of grit & determination and the struggle to achieve success besides all odds. To describe or write about a movie of this stature one cannot find enough words to express oneself. But, I will definitely try and summarize it from the heart on the different levels the movie worked for me. I came out pretty impressed with the way Rakeyesh Omprakash Mehra has managed to depict the life of “Flying Sikh” in a movie slightly over 3 hours and NO, I did not get bored at any time in the movie. The script demanded the detail and though some sequences definitely match upto speed of the man on whom the movie is made, the rest of the film jogs along just fine. The race sequences have been shot very well and the climax is enduring and keeps you on the edge though most of us already knew the outcome. A true account of the life of Milkha Singh, the movie starts with him loosing the legendary 1960 Rome Olympic race and flashes back to his life tracing the journey from his child hood (born in the undivided India now Pakistan) to the great athlete he ultimately becomes making India proud. The various times in his life are brilliantly interwoven into the plot from the time he lands up in Delhi as a refugee from Pakistan to taking up the life of crime and then moving onto the Indian Army which ultimately changes his life. The sequences where the natural athlete in him is discovered by a Services coach and his ambition to wear the Indian sports contingent blazer are emotional yet inspiring. Full marks to Rakeyesh Omprakash Mehra for using his signature style of inter-weaving flash backs with the present to tell a story which is not only inspiring but emotional to the core. He has been able to effectively depict how necessity drives a man to ambition and that ambition converts to passion. Mr. Mehra will make you fall in love with Milkha Singh and you’ll end up wondering why you never read or heard about this awesome man. An interesting and inspiring personality Milkha Singh has been portrayed by an equally brilliant and awesome actor Farhan Akhtar. Now Farhan Akhtar has been the best at whatever he does besides acting, including directing & singing, but I am sure he would also be contemplating that this is his best performance till date. 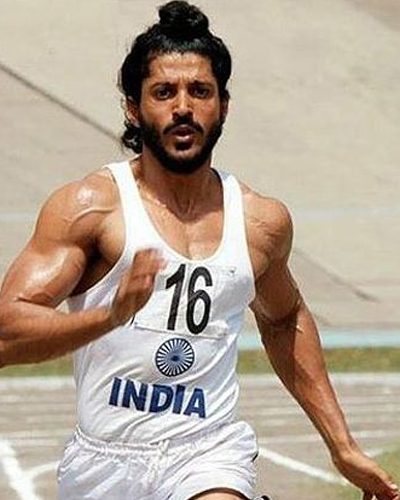 There was no Farhan Akhtar in the movie, you could only see Milkha Singh in the movie. He became one with the character that one could not differentiate between the two. His rigorous training sessions to acquire the lean body of the athlete definitely shown in the movie and his dedication matched that of the original Milkha Singh. Some sequences have of course been dramatized for the movie effect but Farhan makes them look so believable, you end up disputing the fact that they actually happened. The part where he tells his coach that he will wear the Indian team blazer one day has makes you want to do the same. Farhan’s look is as close to the real Milkha one could get. The original athlete’s nuances, the running style and the inner turmoil which he went through has been picked up closest to the original and though it has already been said countless times, no one could have done a better job of portraying this character. The movie is an out an out Farhan Akhtar movie, but the only 2 actors that can be mentioned in the same breath as him are Divya Dutta and Pawan Malhotra. Divya Dutta as Milkha Singh’s elder sister, the one who looked after him after his parents were killed, gives a powerful emotional performance and ups the emotional quotient of the movie manifold. Every time she comes onscreen you can’t help but cry even when she doesn’t say much. Pawan Malhotra who has proven himself time and again as an actor, once again proves as Milkha Singh’s coach that there no a better actor than him when it comes to supporting roles. The large than life character and the actual influence this coach had on Milkha’s life is portrayed by flawless ease and his comprehension of the character adds another dimension to Milkha’s character. The young Milkha Singh portrayal by young Master Jabtej Singh is equally brilliant and the intensity the kid showed as the young Sikh makes him a deserving for future accolades. Yograj Singh (cricketer Yuvraj Singh’s father) as Milkha’s coach Ranvir Singh and Prakash Raj (finally he gets a break from playing baddie in Cop movies) as his unit’s commanding officer support the lead character well. Sonam Kapoor as Milkha’s love interest gets the best composed scenes, and though she does not have much to say in the movie, she delivers an effective understated performance. Rebecca Breeds from Australia in her first Indian movie gives a pleasant and light performance in the otherwise intense movie. Music by Shankar Ehsaan Loy, forms an integral part of the movie. The title track “Zinda” is something you’d come humming out of the theatre. My favorites were the Army barrack song “Havan Karnege” and the “Slow motion Angreza” shot in an Australian pub. The music is easy on the ears and difficult to forget. The Character and the original … the movie symbolizes that no matter how fast you run, the life never does have a finish line!!! 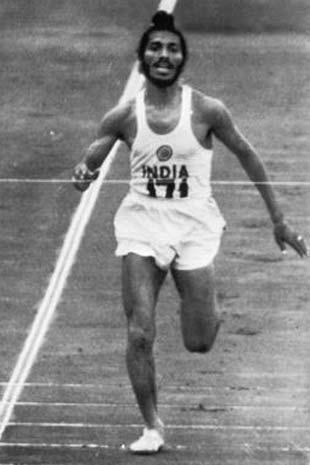 Milkha Singh ran for our country for long and has been remembered for time immemorial. A rare sports person and you can read about him all over the internet. This movie does complete justice to his biopic, both as a sportsman struggle and symbolically conveying that life’s struggles don’t have a finish line. The movie takes Indian cinema to another level and though there will be many more to come this year, my nomination for the Oscars is definitely Bhaag Milkha Bhaag. Irrespective of your preferences this is a must watch for all Indians. Architect, Entreprenuer, Traveller, Movie buff, Amateur Photographer, Foodie .... do I need to say more! This entry was posted in India, Motivation, Movie, Review, Sports, Television, Uncategorized and tagged Bhaag Milkha Bhaag, Biopic, Farhan Akhtar, Indian Athletics, Milkha Singh, movie, Pawan malhotra, Rakeyesh Omprakash Mehra, review, Track & Field. Bookmark the permalink. 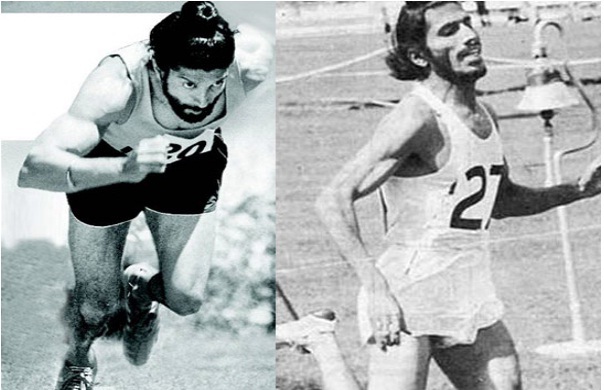 2 Responses to Bhaag Milkha Bhaag … there is no Finish Line!!! You really mean it don’t you ? Ah. Sad. Because after the intermission, I lost interest.